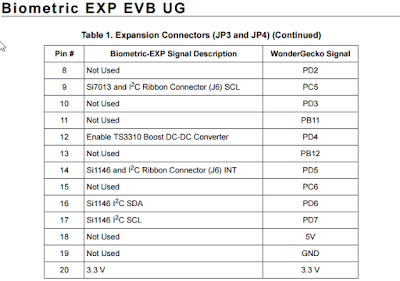 This week I've been having a good look at the the BOIMETRIC-EXP-EVB dev board from Silicon Labs a Fab-less chip manufacturer based in Austin Texas. 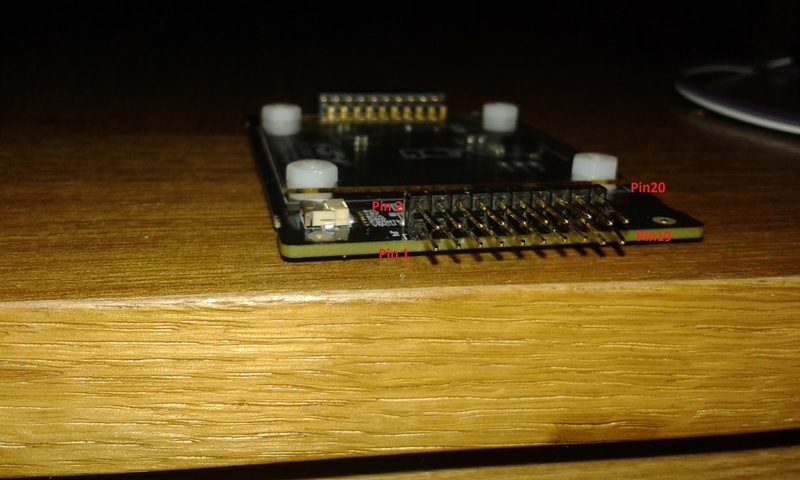 The board is designed as an expansion board for their EMF32 Wonder GEKO development system. 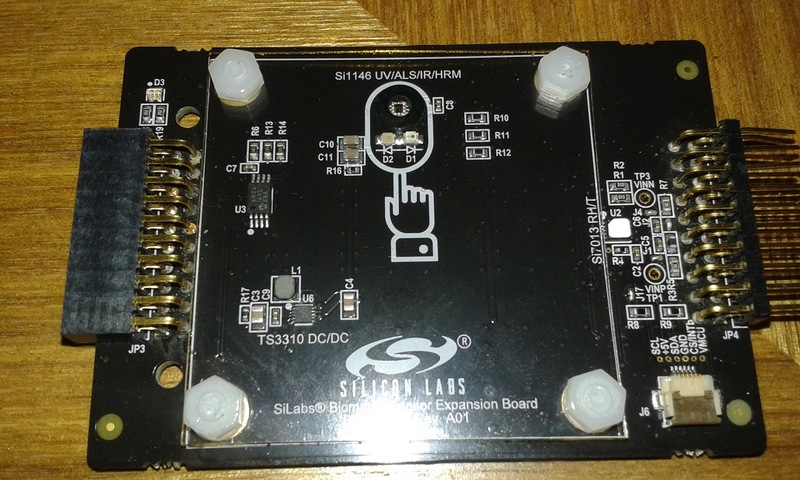 The board contains a SI1146 Ambient, IR , UV and 2D Gesture sensor, SI7013 Temperature and humidity and a TS3310 step up DC to DC coveter. The dev board also contains a Microchip 24AA024 eeprom that I believe it communicates with other Silicon Labs contains specific info about the board. It also has a green and red LED for good measure. This development board is around $29.00 at the moment so if you fancy toying with a selection of sensors then I recommend it. Just to note the development board is runs both power and logic at 3v3 so if your are using a 5v platform like and Arduino Uno you will require a I2C compatible logic level shifter for that data lines or there is a risk of damaging the dev board. 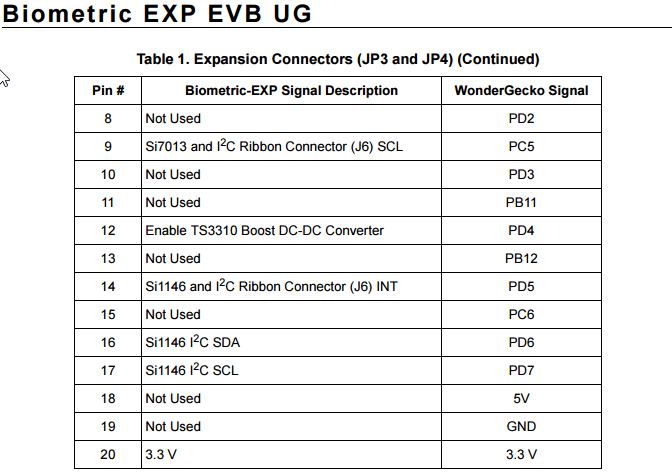 All the devices on the board communicates with a two wire serial protocol called I2C. This is a bus based protocol that requires devices on the bus to have individual 7 bit addresses. 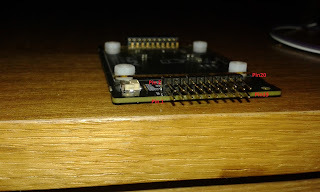 To use these I2C devices SDA ( serial data ), SCL (serial clock ) and GND ( ground ) need to be connected. There is a little bit of a got-ya with wiring up this board in the datasheet states that the the Si1146 SDA is connected to pin 16 and SCL is connected to pin 17 this is true for the JP3 header this is the one on the left side of the board, but on the right side the JP4 header it is connected to pin 15. The INT pin is used for interrupt driven reading of the sensor when it when a sensors readings are ready this pin will change. 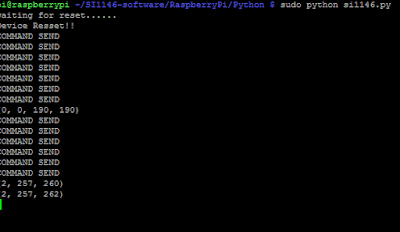 For my tests I'm using a Raspberry Pi B+ and coding in python using the SMBus module which runs the Raspberry Pi's I2C bus. The pin numbers start at the bottom or south of the board and go across the header starting from the bottom row hopefully this picture makes more sense. 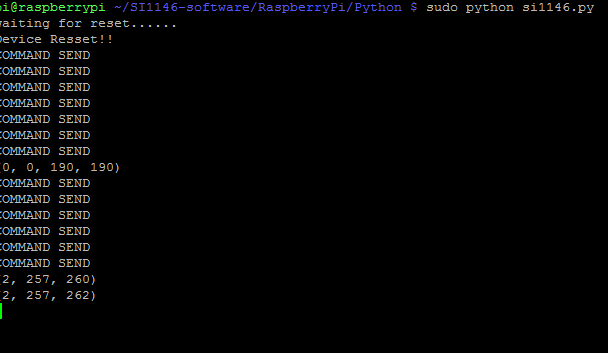 I have spent a few hours getting this to run in Python and at this moment still working on the code to make it into a python module for the Si114x range possibly for a future development. My work so far is available on github Here. The moment it is just a single program that runs the Si1146 and outputs its data on screen. This will output UV index , Proximity sensor and visible light level. currently having a lot of fun with this sensor and will keep updating especially when I get as far as using the sensor to measure pulse and 2D gestures. 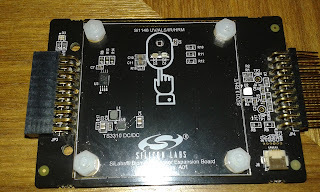 At a later stage I will be revisiting the Si7013 temperature humidity sensor an see if I can finally get it running with a Raspberry Pi.